I've been working with SQL Server 2016 SP1 CCIs more lately... anything I figure out before Niko Neugebauer or Joe Obbish have given them full treatment in their blogs I'm gonna try to get in here right quick :-) Niko's and Joe's blogs are both on my 'must read list' by the way. Today I was tinkering with some CCIs... doing something that I often do: speculating about a system I haven't been able to access directly, trying to come up with theories to explain unexpected behavior. Along the way I found something interesting I hadn't heard anyone mention: a tipping point for count(*) aggregate pushdown against a CCI. Here's a quick repro if you want to follow along. Let me walk through it quickly. 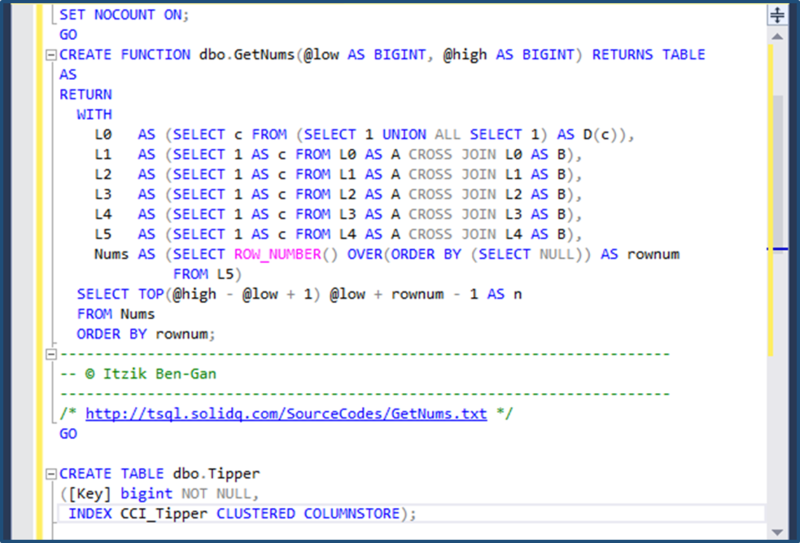 So create the getnums function and the Tipper CCI in my database. OK, lets use the getnums function to add 50 fully populated (1024 * 1024 rows) to the CCI, with incrementing values in the [key] column. 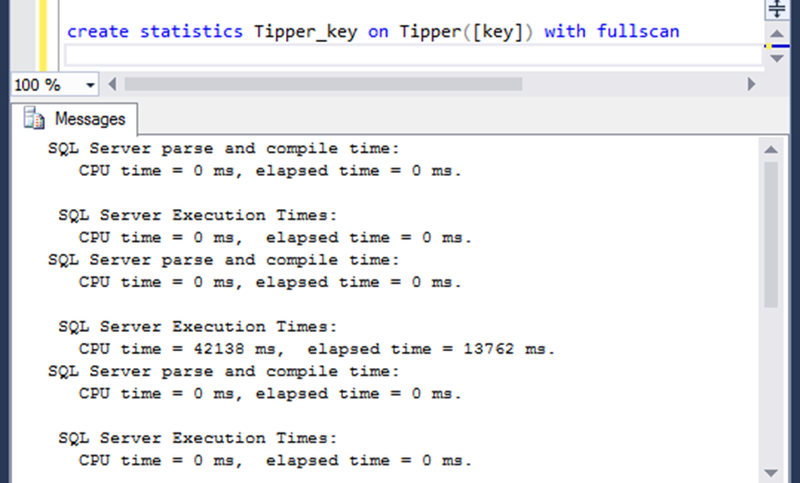 Now lets create fullscan stats on the [key] column. Fullscan stats and values starting at 1, incrementing by 1 give a little more predictability to row estimates in the plans. 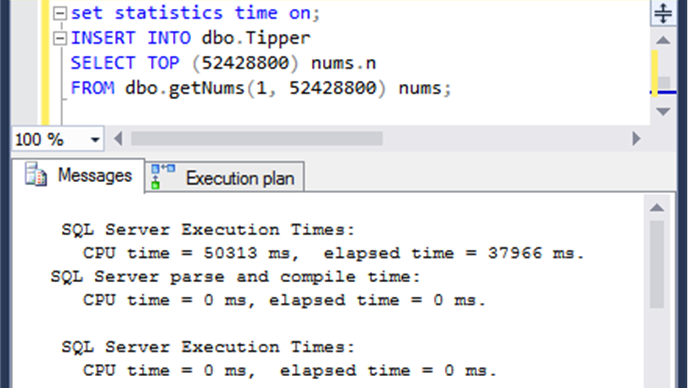 Below is what we want post-execution plans to look like when counting rows in a range - the thin arrow coming out of the Columnstore scan is a hint that predicate pushdown was successful. I didn't specify MAXDOP in a query hint, and Resource Governor isn't supplying MAXDOP; MAXDOP 8 is coming from the Database Scoped Configuration. The degree of parallelism turns out to be a significant factor in determining the tipping point. The [key] column is a BigInt. Maybe its surprising that I'm using 27213.9 as the upper bound. But... check out the estimated number of rows :-) Again - this estimate is coming from the Legacy CE, specified in the database scoped configuration for my database. Look what happens if the upper limit is 27213.8 at MAXDOP 8. Row estimate of 27213.8 and... no more predicate pushdown! 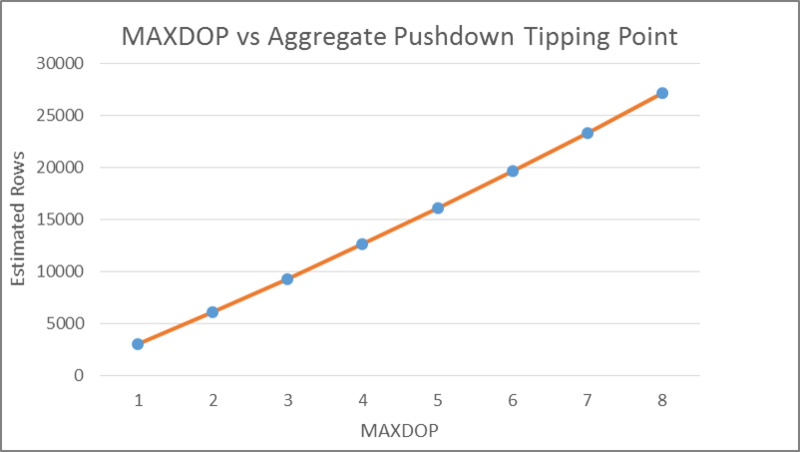 Above I mentioned that DOP is an important part of determining the tipping point, with the cardinality estimator version playing a minor role. 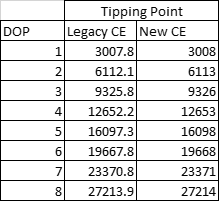 Here are the tipping point values for legacy and new CE, at DOP 1 to DOP 8. The tipping point values are row estimates, remember. That's why the CE only plays a minor role here - since it's responsible for the estimates. The estimates of the new CE are slightly different than the legacy CE - and for this case where the filter is against a BigInt column it looks like the new CE is giving integral row estimates, while the legacy CE estimates are not necessarily integral. Anyway... a graph of the Legacy CE tipping point values against MAXDOP makes the nearly linear relationship clear.